“Gunpowder Proof is riding the wave of hand-crafted artisan spirits that are authentic and all-natural,” said Pusser’s CEO Gary Rogalski. Pusser’s Gunpowder Proof, the last rum issued by the modern Royal Navy to its enlistees in 1970, will launch in seven U.S. markets July 31 to commemorate the 36th anniversary of Black Tot Day. Gunpowder Proof is an aged overproof expression at 54.5 percent which was the formula last used by the Admiralty. This follows a highly-successful introduction in Europe. The unique component of Gunpowder Proof is rum distilled from vintage wooden pot stills, a process that provides a depth of flavor far beyond that of mass-produced rums distilled from “modern” semi-automatic metal column stills. The two existing wooden pot stills, first put in use in the early 1700's and located in Guyana’s Demerara River Valley, impregnate the rum with esters (naturally occurring organic flavoring compounds) far beyond those of any other rum. What results is a truly unique, award winning taste. The name “Pusser’s” is nothing more than a corruption of the word “Purser,” the Royal Navy ship’s supply officer who retained the stocks of rum. Before hydrometers, the ship’s Purser would test rum strength by mixing a few grains of gunpowder with rum to see if it would ignite under the heat of a magnifying glass. If it did that was 'proof' the rum was “at strength,” if it was not, the Purser was threatened with bodily harm for “watering down” the rum. Rogalski said Pusser’s will introduce the rum to its Florida, Georgia, South Carolina, Texas, California, mid-Atlantic and Northeast markets with others to follow as the spirit gains traction. The overproof spirit is brandy-like and surprisingly smooth, easy to drink neat, in a snifter or in your favorite cocktail or as a floater to add additional spirit to any cocktail. The daily issue of rum, a tradition which goes back three centuries, ended July 31, 1970 and is affectionately known as “Black Tot Day” in the UK and other Commonwealth countries. The Admiralty formula, a unique blend of rums from Guyana and Trinidad, was ceded to the Company’s founder, Charles Tobias, in return for his promise to make annual contributions to the Sailor’s Tot Fund, now part of the Royal Navy and Marine Charitable Fund. 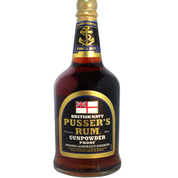 Pusser’s Gunpowder Proof has already won several awards in Europe including a Gold at the International Sprits Challenge, a Master’s and Gold medal in The Rum Masters Competition and Third Place for World’s Best Dark Rum in the World Rum Awards. It also won Gold for Best in Class for the Overproof category in the Rum XP awards at the recent Miami RumFest. This is in addition to the many other awards Pusser’s lower proof 3-year aged and 15-year aged spirits from the same stills have already won. Editor’s Note: Hi-res photos are available upon request.